A full overview of the form editor and settings. Take control of your Forms! 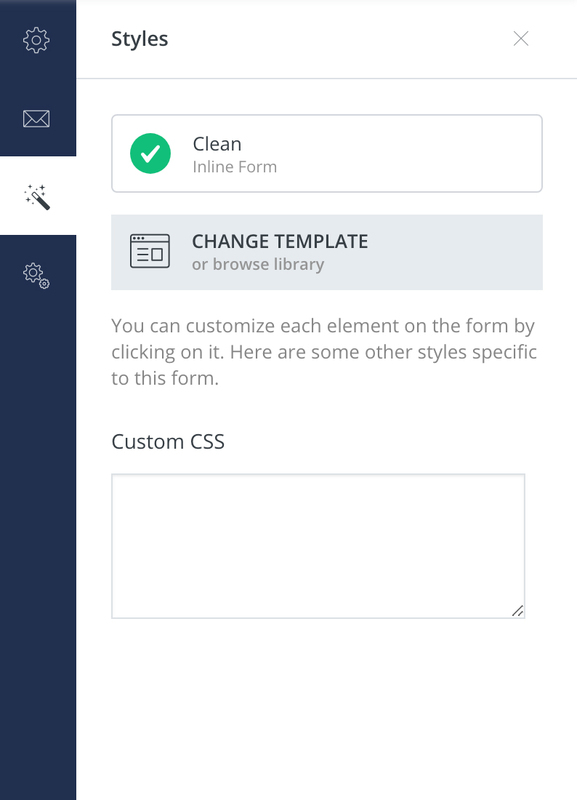 Customizing your Forms is a must and you’re about to learn every tool our form editor has to offer. Just getting started? Check out our Beginner's Guide to Forms! Any area you can click, you can edit. That means you can edit the Header, Description Box, colors, font sizes, names of fields, and more. Renaming a form is as simple as clicking on the title. This name will only be visible to you as the account owner, so we’d suggest using names that help you stay organized. This is where your form comes to life! From settings to styles, they’re all here. 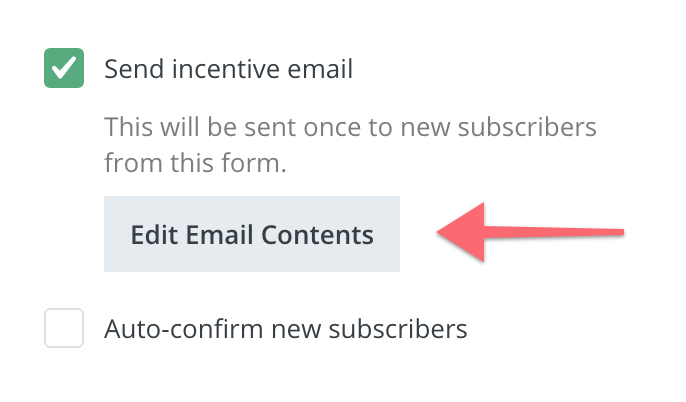 In the settings area you have the option to decide what a subscriber sees after subscribing to your form. 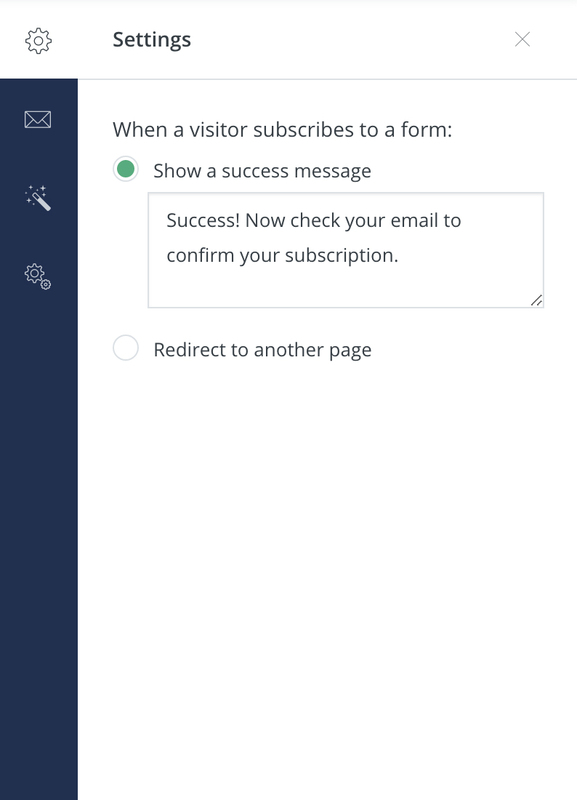 Show a success message: This message will show directly inside the form after a subscription. Redirect to another page: Send new subscribers to a thank-you page or any other page on your site. Need some help setting up your thank you page? We’ve put together examples and suggestions for how to set up a great thank you page. You may also know this as the Confirmation Email. This is the email that sends as soon as someone subscribes to your form. By default your form will be set to double opt-in, which lowers the barrier to entry for new subscribers. However, subscribers who click to confirm and receive their incentive are far more successful at staying with you for the long haul! Sending your subscribers a double opt-in (Incentive Email) is really beneficial. This two-step process creates a list that is both confirmed and engaged, which will lead to long-term list growth, and sustainability. Note: Clicking the X at the top right will close the incentive email editor will both save the contents and close the editor. You can also choose to Auto-confirm new subscribers. 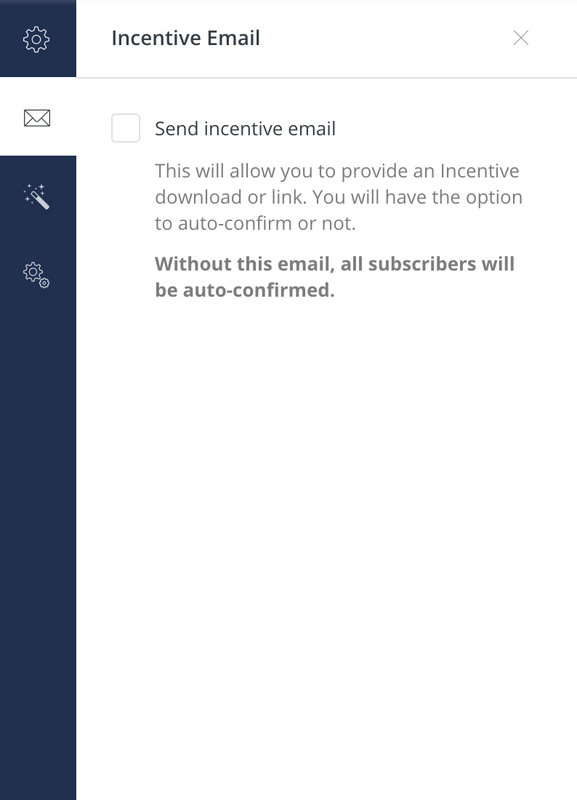 This option will still send the Incentive Email so subscribers can download their incentive, but it will no longer require that they click the button to confirm their subscription. 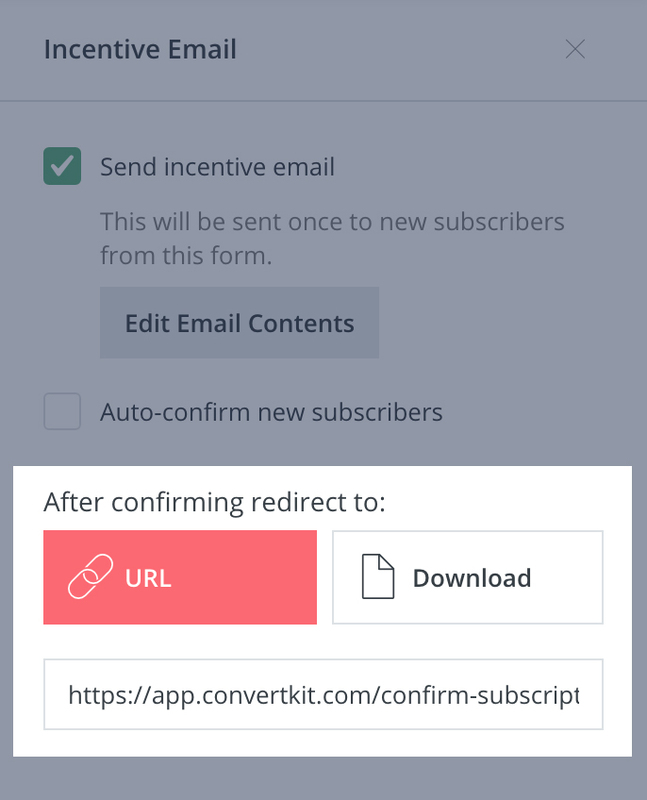 Finally, you can set the button in the Incentive Email to send subscribers to a URL, or upload a file for them to download. In the styles menu you’ll see the current form template you’re using as well as an option to change it. Depending on the form template you’re using, you’ll also see other main style options such as background color, border radius, and background image. You also have the option to add custom CSS in the style settings area. Note: These options will change as you click on different parts of your form such as the fields, subscribe button, and even the “Powered by ConvertKit link”. To return to the main style settings of your form, click the magic wand again at any time. There are a few really great settings in the Advanced menu, that help give your form a polished experience. The first is an option to change what's shown to return visitors who have already subscribed to the form. You can continue to show the form no matter what, hide the form completely, or show custom content. You can also choose to send the subscriber’s information to your thank-you page. This gives you their name and email address as a URL parameter that you can then use for customization on your site. 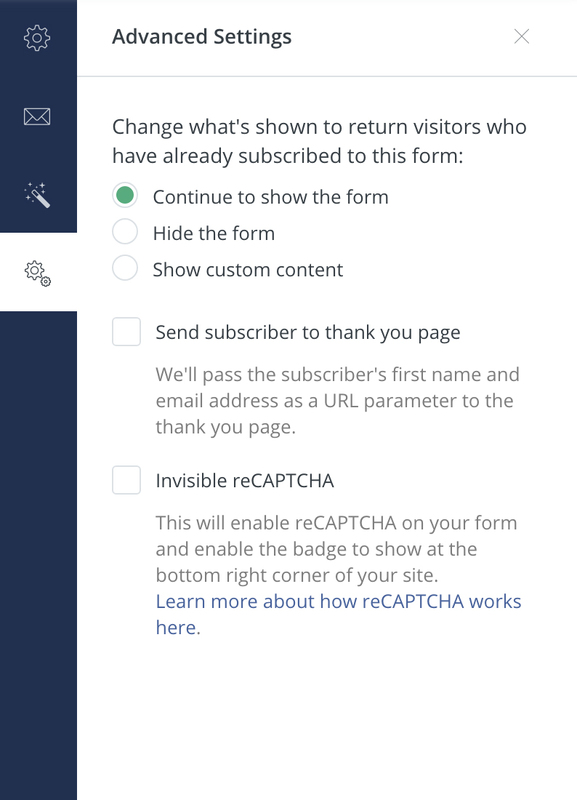 Finally, you can activate Invisible reCAPTCHA. This option helps protect your list from spam sign-ups by requiring verification from those trying to sign up a few too many times. Learn more about how reCAPTCHA works here. The menu bar at the top right of the editor has options for previewing, embedding, seeing activity reports, and saving your form. You can also archive, delete, and duplicate your form in the other options menu. Clicking Preview will let you see the form as it will appear when embedding. The sidebar menu and other options will disappear, but you can always bring them back by clicking Preview again, to end the preview. This option allows you to copy the full form code to your site, which can be really helpful if you’d like full control over the code. Want a simple link to share? This is the place to do it! Sending someone to this link will open the form in its own window. Note: This option is great for sharing to someone who’s already interested, but if you’re sharing this to a large audience, we’d recommend checking out our landing pages. The WordPress Plugin allows you to use the shortcode found here to embed a form in any of your pages or posts. Important: If you use WordPress for your website but haven’t installed and set up the plugin, this code won’t work. If you’re using Unbounce, this option will give you the URL for your WebHook settings. The Reports page shows how many visitors and subscribers your form has received, as well as the conversion rate and top referrers. Note: If you’re using a third party service for forms, visitors and conversion rate won’t be accurate. Visitors can only be calculated when using directly embedded ConvertKit forms or the WordPress plugin. Archive: Removes the form from your main active forms page, but keeps the form available for new subscriptions. Delete: Completely removes the form and makes it no longer available. This can not be undone. Duplicate: Makes a new form that has the same style and settings of your form. Most lead generation integrations come in through our Forms, like LeadPages, SumoMe, and OptinMonster. If you create a Form with a third party Form Builder, you'll want to create a Form to match in ConvertKit. You can think of your Form in ConvertKit as the backend to your other Form--it needs to exist to send your subscribers to ConvertKit. Then, you can run any automations based on the ConvertKit Form. Creating a ConvertKit Form for each third party Form also makes it really easy to know exactly where your Subscribers opted in. As many as you want! You are not limited to a certain number of Forms. Do I need to tag a user when they opt in to a Form? No, you don't! A Form can actually be used in place of a Tag. You can read more about that here. Can I put a Form on my non-Wordpress site?